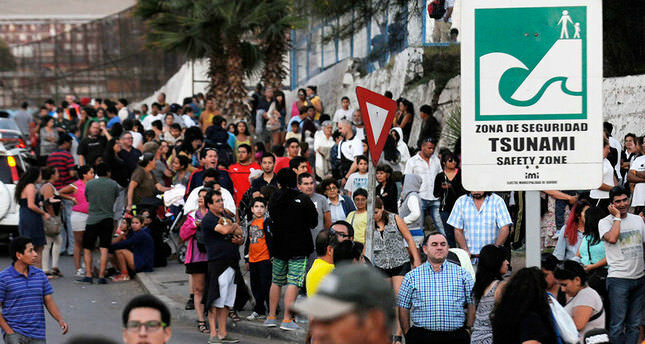 A powerful magnitude-8.0 earthquake struck in off Chile's northern coast Tuesday night, and authorities ordered an evacuation of coastal areas in case of a tsunami. There were no immediate reports of injuries or damage. The U.S. Geological Survey said the quake struck 61 miles (99 kilometers) northwest of the city of Iquique at 8:46 p.m., shaking a region that has been rocked by numerous quakes over the past two weeks. The latest tremor also shook buildings in parts of the nearby nations of Bolivia and Peru. Waves measuring almost 2 meters (6 1/2 feet) already were striking cities on the northern coast.